An 82-year-old man has died six days after a multi-vehicle crash, police say. Four vehicles were involved in the incident at about 18:00 GMT on 20 March on the A458 in Rowton, Shrewsbury. The West Mercia force said the man died from his injuries in hospital. 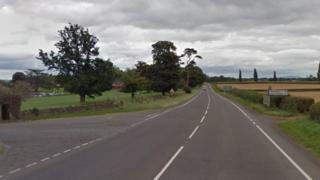 It added one of the four vehicles did not stop at the scene, and was believed to have damaged its rear, nearside light in the collision. Police have not issued a description of the make or model, although they have appealed for witnesses who may have seen another vehicle - a blue VW Polo - being driven near the scene shortly before the crash. A spokesperson said investigations were continuing and officers wanted to speak to motorists who may have dashboard camera footage.